『이한진 전예 경산전팔쌍절첩(李漢鎭篆隸京山篆八雙絶帖)』은 18세기 후반의 전예 명필인 경산 이한진(1732~1796? )이 59세인 1790년(정조 14) 겨울에 오언율시 여러 수를 전서와 예서로 쓴 것이다. 전서는 획이 가늘고 굵기가 일정한 당나라 이양빙(李陽氷)의 옥저전(玉箸篆) 계통이며, 예서는 동한시대 예서비로 유명한 와 를 혼합한 듯하다. 이한진은 앞 시기의 명필인 이인상과 송문흠의 전예서풍을 계승하여 이를 발전시킨 인물로 이 서첩은 현존하는 이한진의 몇몇 필적 가운데 그러한 면모를 가장 잘 보여주고 있다. 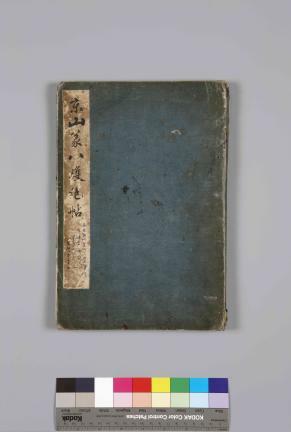 This is an album featuring a series of five-word regulated poems written in the hand of Yi Han-jin (1732-1796?, pen-name: Gyeongsan), a celebrated calligrapher of the late 18th century. These calligraphic works were made in 1790 (the 14th year of King Jeongjo’s reign) when Yi Han-jin was fifty-nine years of age, in seal script and in clerical script. 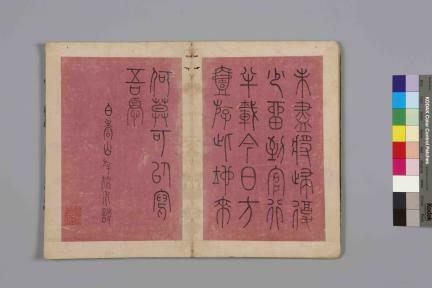 His seal script works are in the so-called okjeojeon style, well-known through the brushwork of the Tang-Dynasty calligrapher Li Yangbing. As for his clerical script, his style is a mixture between the styles of the Li Qi stele and the Cao Quan stele, two Eastern Han steles famous for their seal script inscriptions. Yi Han-jin inherited the seal script style of great Joseon calligraphers who came before him such as Yi In-sang and Song Mun-heum and took it to the next level. This album is arguably the best of his surviving writing samples in terms of evincing his talent and the tradition of which he was the heir.